Dream & Grow Bedside Bassinet - Dalton is rated 4.3 out of 5 by 24. Dimension (in) 27" x 41" x 34.42"
Mattress: Remove structural boards. Fasten all hook-and-loop tabs. Machine wash in cold water. Air dry flat.Bassinet: Spot clean with a soft, clean cloth and mild soap.Bassinet Sheet: Machine wash in cold water. Air dry flat. Rated 2 out of 5 by Laila from Disappointed Not very sturdy and the mattress is very very thin. You can feel the board underneath. I probably won't use this at all. Will be buying a different bassinet, different brand. Rated 2 out of 5 by Disappointed mommy from Disappointed I bought this bassinet thinking the brand and pricing would ensure a good product, but like a prior review I came across I have a board that is bowing in the middle. Not only that the slots on the height adjustment tubes that hold the bars in place have broken so we can't even use it. I called customer service only to be told to put a ticket in on the website after waiting 8 days I get an email stating it's out of stock but I can destroy the bassinet to get a partial refund. I come on the website and the product is available so I call back in only to NOT GET ANY HELP! JUST TOLD TO REPLY TO THE EMAIL..SMH WHY HAVE A TELEPHONE CUSTOMER SERVICE REP IF THRY CAN'T HELP?? SO DISAPPOINTED! Rated 1 out of 5 by Sam09 from Upsetting I got this bassinet for a gift, looks like an amazing bassinet but not even a month in the board started to bend in the middle. Called for another board and again a month later started to bend. This is a big concern for my son. I have never been so disappointed in my life! 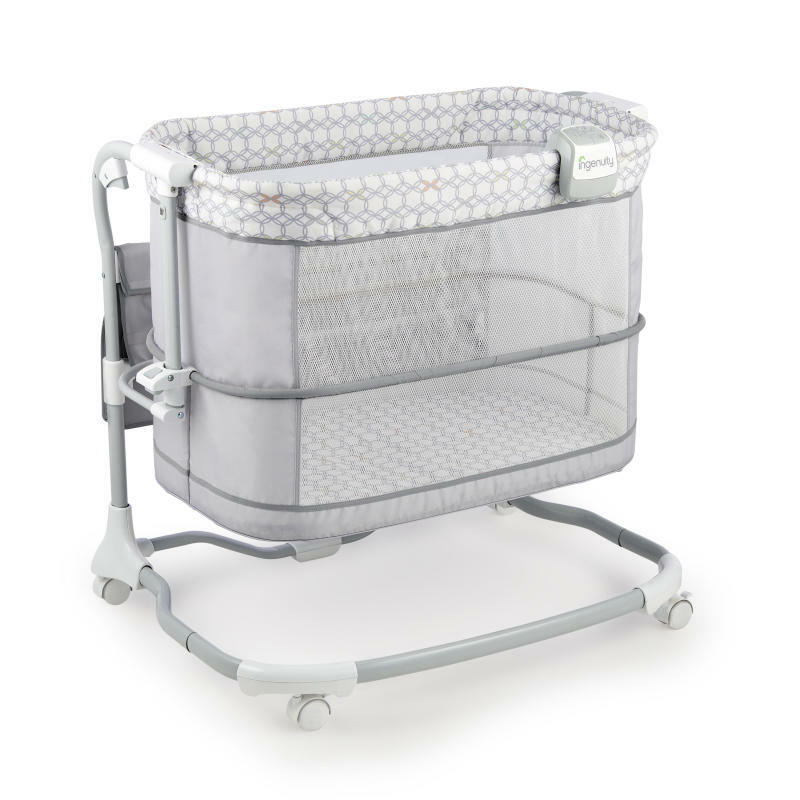 Rated 5 out of 5 by Purpleswimmer from Life changer I LOVE this bassinet! It fits perfectly beside the bed. I love that its on wheels so i can easily move it around the room and the ability to change to height allows me to easily use it next to the bed or around the house as my little one sleeps. Rated 5 out of 5 by Misha06 from Perfect for our little guy. When we brought it home I was so excited to see how it works before we had our son. I absolutely love how I can get it close to our bed without worrying about him. I know he is safe sleeping in there, and all I have to do is roll over and I can watch him sleep. Literally perfect. Rated 5 out of 5 by queenbmarie from awesome room! This is simply amazing, the room that the Bedside Bassinet has is very spacious! One of the greater features is it can roll into any room while the child is asleep or awake! She actually sleeps very comfortably all night which helps me have peace of mind that she does like the bassinet. Also, another benefit is the side pockets which are great for storing diapers, wipes, lotions as well as any creams or medications you might need that do not require refrigeration. One of my favorite things about this dream & grow bedside bassinet is that it is so deep that if she awakes before I do then I do not have to worry about her being able to crawl over it and hurt herself. It is very deep and secured to protect your child for naps or for bedtime. I am very pleased with this and I enjoy the engineering put behind it to make it. The style is very neutral so is perfect for any color room as well as any gender! The light that is attached on the side you are able to move to any area you would like for your easy access and it doesn't wake your child it is very soothing and not bright, which makes it easy for mom and helpful for baby! Rated 5 out of 5 by Ashley18 from Exactly what we needed The bassinet was easy to assemble and I love that it’s super easy to adjust the height! Seems to be great quality and perfect for those newborn sleepless nights. I also like that it’s easy to move from room to room.